In my weekly column in The National newspaper, I answer a reader who quit her job after her divorce and is living on a visit visa with no accommodation - but her husband is not providing financial support for her two children under three. 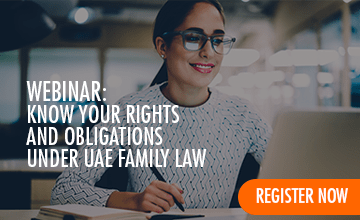 I explain to her that as long as her husband is still a UAE resident, UAE law expounds that all fathers must provide maintenance for their children as long as they are dependents; that is until they have finished education or married, if they are girls. The woman must register a case with the Personal Status Court, which will first look to settle the case amicably before initiating court proceedings. What can I do to increase my ex-husband's financial support? In my weekly column in The National newspaper I advise an ex-wife who is non-resident in the UAE on what her rights are in claiming increased alimony in line with the increase in her ex-husband's salary; and I outline the legal options a British man living in Abu Dhabi has in relation to filing a case against his wife who has absconded with their child back to the United Kingdom. The case is tricky, as the man is yearning to see his child but does not want criminal charges to be filed against his wife - however, as I explain, UAE law does not leave much alternative. Will my ex-husband's appeal case affect my alimony appeal? In my publication this week, I discussed alimony for divorce women. If the women want to increase the alimony, she can go for an appeal with an additional evidence, requesting for the alimony increase and the appeal court can amend the judgment. When the women get a favorable verdict to seize the ex-husband's asset, even if the ex-husband doesn't have any asset to seize, subsequently the women have the right to request from the execution court to blacklist the ex-husband. Can my husband dodge financial support payments? In my publication this week, firstly I explained that "Ishqaal" filed by the husband in alimony and custody settlement matters, shall not suspend or freeze the proceeding as per article No. 11 of the UAE Personal Status Law No. 28 of 2005. Thereafter, I discussed the ruling of the Supreme Court of Dubai in case No. 26/2002 regarding the understanding of defamatory remarks. Can I Claim Financial Support from My Husband for the Last 10 Years? In my interview this week in The National newspaper, I addressed whether a wife can claim financial support from her husband dating back 10 years. I also discussed whether a wife can get the money she is entitled to in the circumstances where her husband has a lot of bounced cheque and civil cases. Can My Husband Force Me to Stop Work? In my interview this week in The National newspaper, I addressed whether a husband could force his wife to stop working after getting married. I also discussed whether a husband could file a custody case against his ex-wife who remarried two years previously without informing the ex-husband. Will My Husband Be Forced to Sponsor His Ex-Wife and Children? In my interview this week in The National newspaper, I addressed whether a man can be forced to sponsor his ex-wife and children's visa and accommodation in the UAE. I also discussed whether a husband can win custody of his children and under which conditions. What Becomes of Property After a Marriage Is Dissolved? In my interview this week in The National newspaper, I explained how the court allocates financial resources and property in the event of the dissolution of marriage, what happens to the property owned by the couple, and if and when one spouse must pay maintenance for the other after the marriage is dissolved. In my interview this week in The National newspaper I discussed several legal marital matters like the recognition of marriage inside the UAE, marriage validity, and prenuptial agreements.